The Academy was officially opened yesterday. Photo: Fire and Rescue NSW. 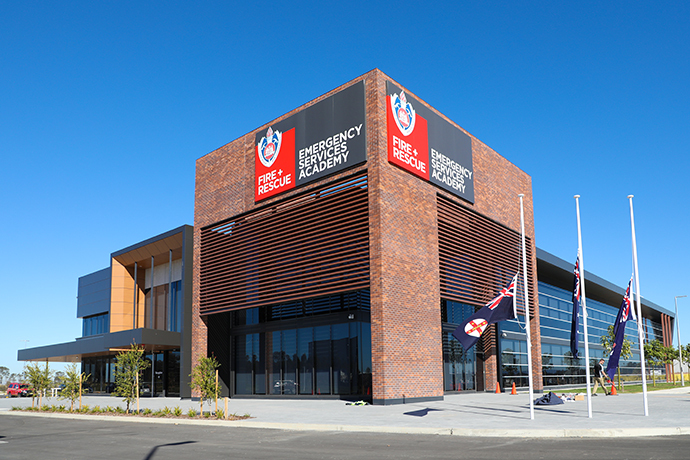 A new chapter has begun for Fire and Rescue NSW (FRNSW) with the official opening of the Fire and Rescue NSW Emergency Services Academy in Erskine Park. Set to create the next generation of NSW fire fighters, the state-of-the-art training academy was officially opened yesterday. Attending the opening was Minister for Emergency Services Troy Grant, Member for Mulgoa Tanya Davies, Deputy Mayor Tricia Hitchen and FRNSW Commissioner Paul Baxter. Mr Grant said it was an historic day for emergency services in NSW. 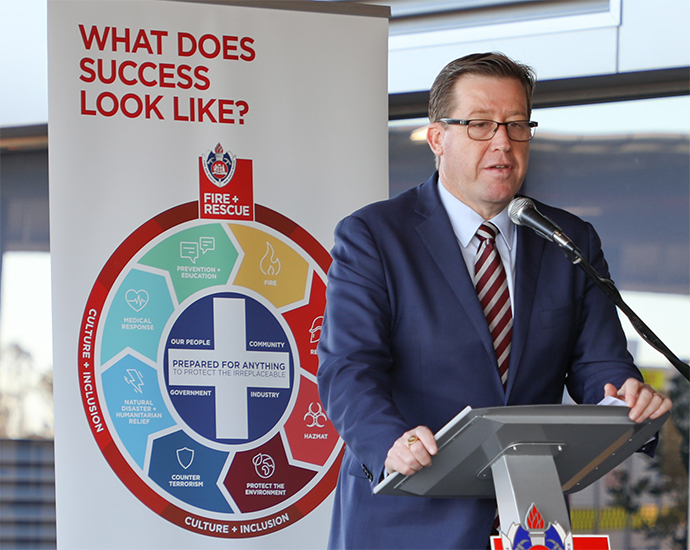 “There is no doubt that each of the training facilities, the academies and colleges that have come before, have stood and helped contribute so much to the proud traditions, history and contributions fire fighting has made in NSW,” he said. Troy Grant speaking at the opening. Fire and Rescue NSW. The six-hectare site at Mamre Road at Erskine Park includes six lecture rooms, offices, a gymnasium and outdoor exercise area, a virtual reality training room and a free station simulation area, complete with a watch room and pole. Member for Mulgoa Tanya Davies said the official opening was not just a celebration for the emergency services, but it was also a great win for the western Sydney community. 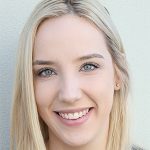 “The Academy is another example of our Government’s commitment to relocating public service jobs and boosting the economy of Sydney’s western region,” she said. Cr Hitchen said the development further reinforced the importance of Penrith within the state. The new Academy. Photo: Fire and Rescue NSW. “This will be a great boost for our local economy with recruits and staff using our local retailers and services and potentially accommodation while training here in Penrith,” she said. The opening yesterday came as a surprise as in May the Weekender reported that the decision had been made to hold the opening until both stage one and two were completed. 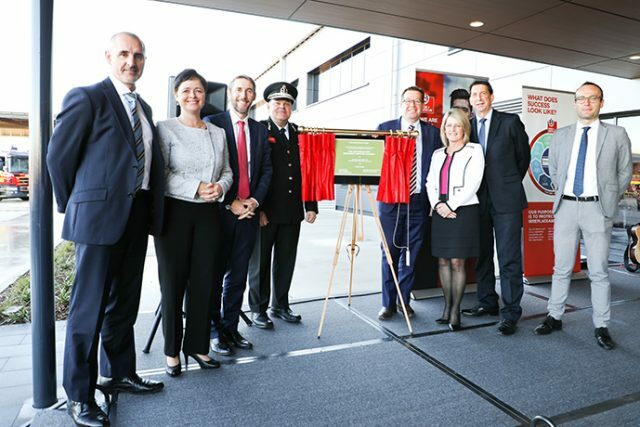 “The state-of-the-art NSW Fire and Rescue Training Academy is scheduled to open early 2019 after the completion of both the academic and physical training facilities,” Ms Davies said at the time. Stage two of the development, which includes a fire tower, is still expected to be completed in early 2019. The academy will replace the existing training college at Alexandria, which is more than 40-years-old and one third the size of the new site.